Little by little and step by step the River City Casino shows have grown to be the prime time viewing for Shamrock Fighting Championships. 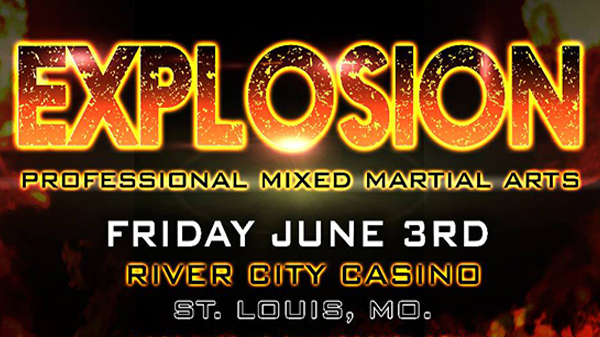 Come June 3, the promotion returns to the South County venue with yet another lively card in "Explosion". The main and co-main events feature three fighters thirsty for redemption. The headlining fight is a rematch from last summer's Bellator undercard when Adam Cella faces Kyle Kurtz one more time. Kurtz stamped his name on the area map with a nice armbar submission of Cella at Bellator 138. Since that time both fighters have had their ups and downs. Kurtz would go on to the next St. Louis Bellator, in November of 2015, and the Jackson, Mo., product snatched up another sweet submission, this time against Steve Mann. Kurtz headlined the last time SFC was at the River City in March when he got his lights shut out late in the second round against Kevin Engel. Kurtz agreed to the rematch after the promotion's first choice for a Cella opponent, Eric Irvin, revealed that he could not recover in time from an injury to make the fight. The 2015 calendar year wasn't an easy one for Cella (6-5) as he lost three times in 11 months. The Finney's MMA product started his career a red-hot 5-1. In the co-main event, Garrett Gross is bumping up in weight to face Aaron Highfill. Like Kurtz, Gross was on the wrong end of a TKO at the March Shamrock FC show when Rashard Lovelace finished him at the 1:51 mark in the first round. Highfill (2-1) was one of the top amateur prospects in the region. He lost his pro debut in devastating fashion in September of 2014 when Bryant West KO'd him in five seconds with a head kick. Highfill rebounded to win twice in 2015, most recently a second round submission of Kevin Brown in December of 2015. "All four of these guys are my type of guys," Shamrock FC president Jesse Finney said. "I love to watch all four of the them fight. They all come forward and they all bring it." Also on the main card, Malcolm Smith will face Garrett Mueller. Mueller is 2-1 including a win over AJ Siscoe at last summer's Bellator. Smith has been out of action for over a year since losing a split decision to C-Jay Hunter. After starting his pro career with two loses against two of the best the area has to offer, Hugh Pulley and Vincent Eazelle, Smith won four out of his next five before the Hunter loss. Also on the main card will be a contrast of styles as the flamboyant Cort Wahle takes on the blue collar Scott Ettling. Wahle made his pro debut with an impressive unanimous decision win over Mueller. All three of Ettling's (3-1) wins have been via submission. Dan O'Connor looks to get back on the winning track when he faces Issac Badger. Badger has dropped seven straight. The popular "Johnny Irish" will be looking for his first win since September of 2014. Fifty-year-old Susie Wyatt makes her pro debut against Nikki Duncan out of Michigan. Wyatt has been a fixture on the amateur scene, racking up nearly 20 fights. Highlighting the undercard will be a four-man, featherweight tournament with the winner receiving a SFC pro contract. Look for the names of the participants to be released later this week. For more information, including ticket purchase, visit shamrockfightingchampionships.com.